South Beach will once again come alive this July, as the swimwear industry’s most highly anticipated event returns for the ninth year. Mercedes-Benz Fashion Week Swim will heat up the sands of The Raleigh Hotel with five days of designer runway shows, presentations and parties beginning on July 17 through July 21. For a complete look at events as well as an extensive list of incredible designers who will be presenting their latest Collections visit: www.mbfashionweek.com. NICOLITA Swimwear, known for its signature fit of ‘Cuban-style bottoms,’ and ExploreModeling.com, a leading online modeling agency, host the 4th annual “Search for the Perfect Booty” Model Casting. 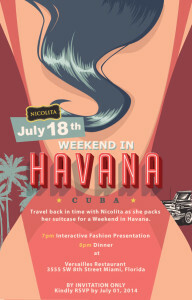 NICOLITA celebrates natural beauty and real curves, and is looking for models of all shapes and sizes to represent the feminine figure during their upcoming 2015 “Weekend in Havana” Collection photo shoot. Hopefuls are encouraged to apply online at ExploreModeling.com. Once the online casting closes, a group of applicants will be selected and invited to attend the final casting call on Thursday, July 17 at The Surfcomber Hotel. This year’s NICOLITA online casting features two special guest hosts, Megan Parken, YouTube sensation and creator of the highly-visited page – meganheartsmakeup, and Cassandra Bankson, YouTube personality best known for her successful modeling career despite suffering from acne; for more information on NICOLITA Swimwear, visit www.MyNicolita.com. For official rules or to sign up for the NICOLITA Model Casting, visit http://exploremodeling.com/Casting/NicolitaModelSearch/Default.aspx. Fashion and philanthropy join forces once again as Style Saves launches ticket sales for their fourth annual fashion show fundraiser. Kicking off Miami Swim Week on Friday, July 18, FORD models will work the runway at the ultra-chic Soho Beach House from 9:00 p.m. to midnight for the mission of “building confidence through clothes.” This Swim Week show bolsters the cause of Style Saves to raise funds for underprivileged students in South Florida. In collaboration with The Miami Foundation, Style Saves works with retailers, designers and boutiques to provide new back-to-school outfits, edifying the self-confidence and assurance these students need to succeed academically and personally. Style Saves dedicates all funds to their back-to-school event, which will take place on August 16 and 17 and offers students the opportunity to “shop” outfits in a department store-style environment before returning for the new school year. This year, the Back-to-School event will be hosted at the Adrienne Arsht Center for the Performing Arts in Miami and will benefit more than 500 students from Miami-Dade public schools. 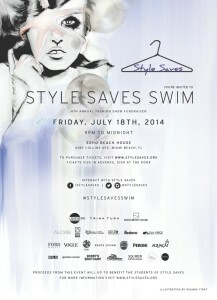 Tickets for the Style Saves Swim Show are $125 in advance at www.stylesaves.org or $150 at the door. To learn more about Style Saves visit, www.stylesaves.org. See you in the Star Lounge! Star Lounge was a blast! Sorry it’s taken me so long to respond!